The hammer on today’s chart is a reversal pattern. This is an indicator that the intermediate downtrend will end. It does not mean that copper will suddenly reverse direction: it could ease into a consolidation zone. The price action today is reflected in the hammer. 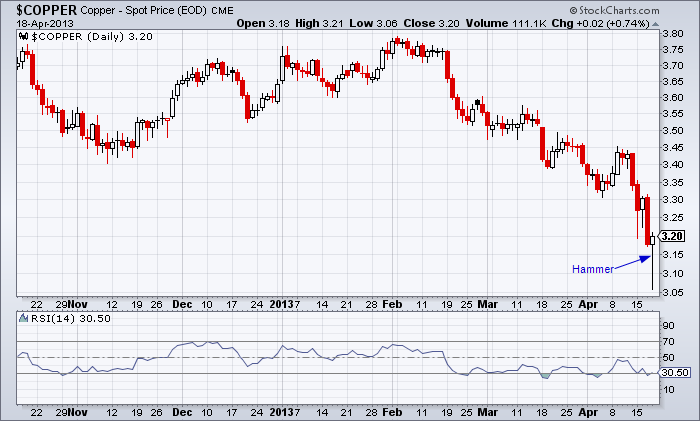 Copper opened at $3.18 and then traded down to $3.06 which was close to major support at $3.00. It then closed at $3.20. Reference the last chart analysis for copper based on the weekly chart. This entry was posted in Other Topics and tagged candlestick chart, copper, hammer on April 18, 2013 by Trader.